Published in the August 2012 NAWCC Bulletin, starting on page 404. Being a rather avid collector of Vienna Regulators I have had a chance to evaluate and troubleshoot a number of mechanism challenges. The three weight mechanisms tend to pose the most opportunities for “meaningful discussions”, in that they are the most complex examples. More specifically, the hour-strike train is usually the problem child. Why is this? Because the hour train has a lot more to do than either the time or the quarter-strike trains. I have one rather unusual early Vienna Regulator with a three train movement but only two weights. Both weights have the same mass, but one weight drives just the hour-strike train while the other drives both the time train and the quarter-strike train. I think that is indicative of the power required for the different trains – twice as much for the hour train as for the other two trains. 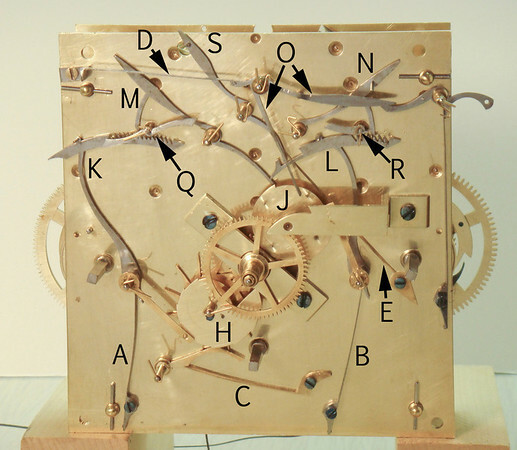 A three-weight Vienna Regulator mechanism counts both the quarter and the hour every 15 minutes. For example, at 9:15 the quarter-strike train will strike once, while the hour-strike train will strike nine times. On the hour the quarter-strike train strikes 4 times while the hour-strike train strikes the hour. Over the course of a day the quarter train strikes 240 times while the hour train strikes 624 times. Most Vienna Regulators have the same size weights on all three trains. Meaning that both the quarter-strike and the time trains are pretty well powered, while the hour-strike train is the one that will let you know if the mechanism needs cleaned. And, given its’ more challenging task, it is also the train that tends to be “adjusted” most often by would-be master-clock repair folk who can’t get it to work. It is probably not necessary to point out, but I will anyway: The hour strike train on a long duration (month, 3 month, 6 month, once in a great while, year) 3 train mechanisms are especially sensitive to problems, and adjustments. These are the trains that have helped me fine-tune my understanding of the challenges that hour-strike trains face.